The Canadian live music scene is booming and it doesn’t just apply to concerts by Justin Bieber and The Weeknd. During 2016, 34.8% of Canadians who responded to a survey said they attended a music festival during the year, up from 29.4% during 2015. Consumer spending on music related activities has been undergoing various changes in recent years. In 2016, the admission to live music shows and the purchase of physical music accounted for 31% and 16% of total consumer expenditure respectively. As an artist, your fan-base is supposed to grow over time with your show attendance reflecting that. While it is natural to hit a plateau from time to time, you need to investigate why it is happening. 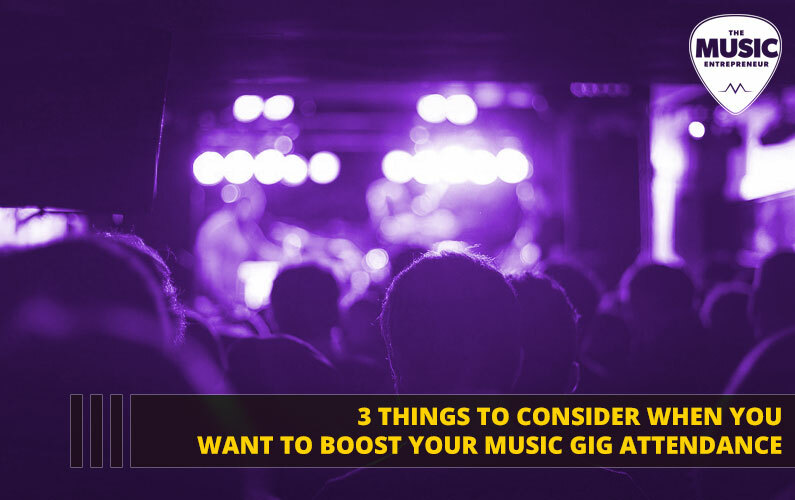 If the turnout at your local gigs is constantly low or stagnant, there are three key areas you need to investigate: Your promotional plan, the shows themselves, and finally, your music. By making changes to even just one of these areas, you can draw a significantly larger crowd to your shows in the future. 1. What is Your Promotional Strategy? A local show needs to be promoted at least two months prior to the event, and should include both print and electronic marketing. It is easy to fall into a repetitive routine that relies on the absolute minimal effort, and while this may be enough at times, you will not see any growth in attendance unless you make the effort to formulate a relevant and effective promotional strategy. Seek exposure from local internet or college radio stations. Find a show that fits your style and audience and inquire about a guest appearance. At the very least, you may be able to secure some airplay for your music as well as advertise your upcoming gigs. Seek out online and print press. Features, interviews and reviews can do wonders for your career in terms of creating awareness for your music. If you are battling to get the attention of more well-known outlets, you can work towards it by collecting clips from blogs as they are often run by great writers with a loyal following. Boost your event on Facebook. Even people who are formally invited to an event can overlook or miss it due to Facebook’s algorithms. Boosting your event will increase its chances of being noticed. 2. What Are Your Gigs Like? Several factors determine whether your shows are well-received or not. The most obvious of these is of course how good your set is. Other factors to consider are the day of the week you are performing, as well as where you are performing. If you do the same things every time you perform without seeing any improvement in attendance, you should consider changing things up. Try a new live-music venue or a different day of the week, and see if you notice any changes as far as attendance is concerned. It is important to perform regularly while avoiding over-saturation. If you have been playing similar gigs at the same few venues for years without fail, perhaps you should take a break to allow some excitement to build in between your shows. You can also employ a number of tactics to make your shows more memorable, such as tributes, benefits and going all out with décor, etc. Make attending your shows as appealing and as easy as possible for your fans. A secure venue as well as an ethical and reliable ticket-sales system are just two of many crucial factors that require careful consideration. 3. Do People Enjoy Your Music? Your show attendance will never increase if people don’t enjoy your music. It is very noble to hold onto your integrity as an artist, but if people are not responding well to your music you may have to rethink your approach. Perhaps your particular genre of music is not popular where you live, or people have just not warmed up to your stage personality yet. As harrowing as it may be, you need to seek honest feedback about your music and if necessary, either adapt your material or seek an audience that will appreciate it. Live music will always remain an important part of the music industry. While music streaming and online music videos are skyrocketing in popularity, nothing beats the exhilaration experienced from attending a live show. As a musician, it is imperative to never disregard the power of live music. If your fans attend and enjoy your shows, they are bound to support all areas of your career, boosting your chances of becoming a commercial success.